At school these days, if Samantha gets a smiley face every day, she gets a “treasure box” on Fridays. This week, she picked a pad of paper. 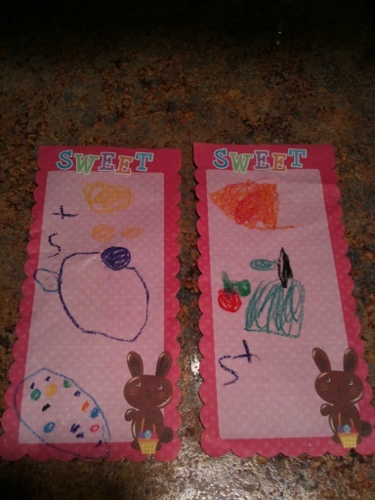 She came home and drew all over the papers, taking the bunny to a vegetable patch, and a flower patch. Then she started making lists. She made a list of what she wanted for breakfast. It was butter, eggs, milk (we get 1% milk at Publix, which is purple), and sprinkles to make pancakes. She also made a list for the grocery store: pizza, apples, and pears. I actually really used Sam’s pancake list on Saturday. I can never remember which sprinkles Sam wants on her pancakes and have been appropriately criticized for using the wrong ones at least once. This time, I looked at her list to see which color sprinkles she wanted. She was one happy customer. Previous Previous post: We can finally play in the rain! And a poem.